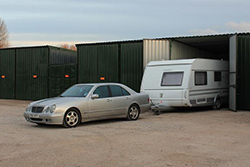 Access Storage offers secure indoor vehicle parking for caravans, motor homes, boats, cars and trailers. Our secure vehicle storage units in Rhyl are unique to us and cannot be found anywhere else in North Wales. This is the first and only silver registered CaSSOA site in Rhyl, Denbighshire. 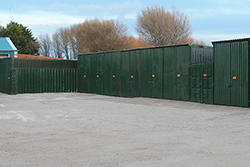 We offer individual, purpose built and fully enclosed parking units for storage of leisure vehicles at Ffordd Derwen, Rhyl in North Wales. Situated four miles from the A55, St Asaph is perfect for a quick and smooth get away on your jolly travels to Cheshire, Towyn, Llandudno, Lleyn Peninsula, Anglesey, North Wales and even Europe ... however often your holiday or short break may be. Caravanning in Towyn, Abergele, Prestatyn, Gronant, North Wales but with your home located in regions perhaps of Chester, Cheshire, Wirral or Manchester ... we invite you to store your caravan with us and forget the cost and inconvenience of towing it all the way back home! Simply leave your caravan in your very own secure indoor storage unit - which is coved by CCTV for your peace of mind - until your next, eagerly anticipated, caravan holiday in North Wales. Our indoor secure parking units can house any height, length or width of vehicle, boat or trailer and can include electricity if required. They are covered by CCTV surveillance and this is a registered CaSSOA silver awarded site. Consequently, you enjoy peace of mind knowing that your prized possession is in safe hands. Our services are designed to enable you to just concentrate on enjoying your holiday. CaSSOA is ‘The Caravan Storage Site Owners’ Association’. This is an organisation set up to provide a standard for secure caravan storage. We are proud to hold a SILVER award and we are the first and only one in Rhyl, Denbighshire, North Wales. *Insurance companies offer a reduced premium for caravan insurance, for caravans stored on a sliver registered CaSSOA site. It is important to note that some will not insure a caravan stored on a site that is not CaSSOA registered. Access Storage has the only silver standard CaSSOA indoor vehicle storage units in North Wales! We have secure garage accommodation for your caravan, motor home, boat, car or trailer.